Arborvitae is an evergreen shrub, with some varieties hardy to USDA hardiness zone 2. It typically tolerates poor soil conditions but does require a planting location in partial or full sunlight. While arborvitae is generally easy to care for, during the first year after planting, it needs special attention to be sure the root ball does not dry out. Irreversible damage can occur if a newly planted arborvitae is not properly irrigated. Water newly planted arborvitae thoroughly the first year. Set your hose next to the trunk, and let it trickle out so that it completely soaks the root ball, not just the soil around it. Leave the hose on for 20 to 30 minutes. Dig down, and feel the root ball. If it's wet, then you've watered it enough. If not, water it for another 20 or so minutes. Time how long it takes to get the root ball wet so you can estimate how long to leave the hose on next time. Dig down a few inches to feel the soil during the first year. If it's dry, water your arborvitae so that, once again, the root ball is thoroughly moist. During the first summer, expect to water your arborvitae every three days. During the spring and fall, watering it once or twice a week will usually suffice. During that first winter, expect to water it once every few weeks, provided the soil is not frozen -- in which case, you can't water it. Water an arborvitae that has been planted for a year or longer sparingly. Arborvitae generally needs little water once established; however, during an extremely hot summer or during droughts, water it with an inch of water to help protect it from the possibility of drying out. Step back and locate where the shape of the arborvitae is becoming irregular. Determine what branches/areas need pruning. Examine the interior of the evergreen, before beginning to prune, noting the depth of the growth. Do not remove all of the existing growth and leave bare branches exposed. Use the scissor-action hedge shears to slowly cut away the growth that has gotten out of shape. For minimal pruning you can use your hand pruners. Rake up the pruned material and deposit it in your compost bin. Dispose of any diseased material. Set up a motion-activated sprinkler near your arborvitae trees. Whenever deer step near the trees, the sprinkler will detect them and shoot out a few streams of water. This will scare the deer and send them in the opposite direction. Collect human hair and place it in a pair of stockings. Tie the stockings to the arborvitae trees. The trick to keeping deer away with human hair lies in using unwashed hair; the deer will pick up the human scent and stay away. 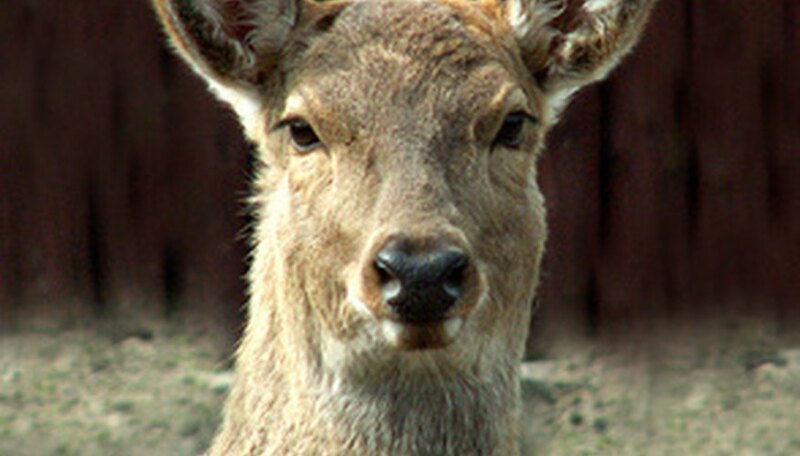 Repel the deer with a homemade repellent made of eggs and water. Beat your eggs and then add them to the water. Use a spray bottle to spray this repellent onto the leaves of your arborvitae trees. Set up an 8-foot-high fence around your property. (Deer can jump shorter fences.) Though an expensive solution, a fence is the only 100 percent effective solution. The fence will protect any arborvitae trees on your property. Prune arborvitae trees once a year in either fall or early winter for best results. They should not be cut back too often to avoid ruining them. Trim the arborvitae trees immediately after the first planting based on the root size. Some arborvitae trees grown in nurseries will be larger than the root system can easily support, so immediate trimming to a smaller size will help the plant grow and thrive. Feel the arborvitae to find the dead zone. While running hands over the plant, the dead zone will feel bare of growth. This area will not grow, so make sure to avoid cutting to the dead zone. Use pruning shears to cut away dead branches. Take off only the dead material and leave the live, green material around it. Cut away any diseased areas. This prevents the spread of diseases or rot. Just snip it away slightly further inward than the diseased section. Wait until early spring to prune the arborvitae shrub, just before it starts to produce new growth. Look at the top of arborvitae shrub and make sure there is only one main vertical branch in the center. If there is more than one main branch, cut 3 to 6 inches off the tip of each remaining branch using pruning shears. Trim only the top one-third of the shrub in this manner. Move down to the middle section of the shrub and cut the tips off here as well using the pruning shears. Reduce the amount that you cut off to between 3 and 4 inches so that the shrub starts to flare out slightly. Move down to the bottom one-third of the shrub and trim 1 to 2 inches off the end of each branch using the punning shears. Stand back and look at the overall shape of the shrub, which should be slightly conical. Trim the tips of any additional branches that stick out of the natural conical shape so that the outer edges slope smoothly downward. Plant container-grown trees in the spring. Spacing should be at least 3 to 5 feet apart if planting multiple trees. Dig a hole with your shovel that is twice the diameter but just as high as the root ball. Loosen the soil around the walls of the hole so the roots will be able to spread out. Place the tree in the hole and backfill with soil, adding a bit of water as you go, to remove any air pockets. Compact the soil and water thoroughly. Add a layer of mulch around the tree's base, a few inches away from the trunk, to keep in moisture. Prune the top of the tree to your desired height or, if you wish, you can leave it as is. Plant in full sunlight in well-drained but moist, loamy, deep soil. Thuja occidentalis shrubs love moisture. Water your Thuja occidentalis once per week or more frequently during periods of drought or hot temperatures, especially when young. Mature, more established shrubs are more tolerant of dry conditions. Shear the shrub to shape it and maintain its size. Prune the shrub lightly in early spring to get rid of tips with winter damage. 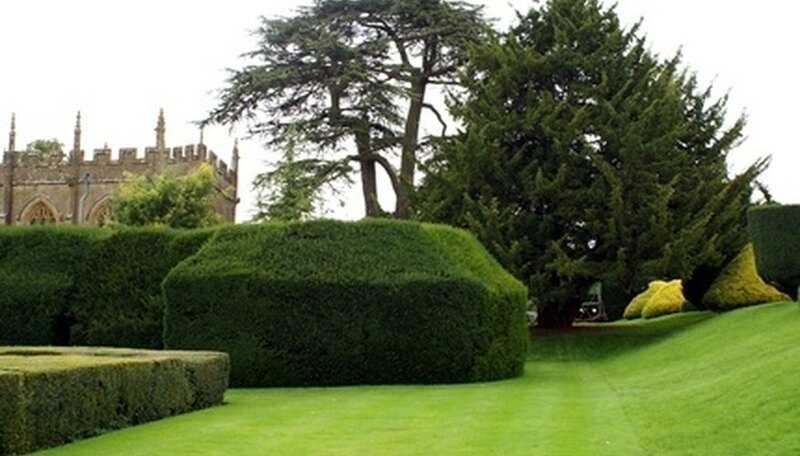 Use hedging shears to make straight cuts on the sides and top of the Thuja occidentalis in late June or early July. Protect the shrub against high winds, heavy snowfalls and ice. Plant your Thuja occidentalis in a protected area and cover it with blankets when an ice storm threatens. Remove heavy snow from the shrub to prevent branches from breaking.